Things are starting to go full meta in Fortnite, as we're now seeing challenges that reference loading screens in order to find the location of hidden Battle Stars as part of the Fortnite Battle Pass Challenges. 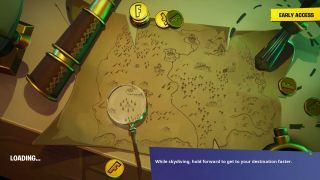 By now you should have unlocked the loading screen in question, especially if you've already completed the search where the magnifying glass sits on the Treasure Map loading screen in Fortnite from Week 3, but in case you haven't we've pictured it above for reference. If you're ready to go treasure hunting, then read on and we'll show you exactly how to search where the knife points on the Treasure Map loading screen, to unlock 5 Battle Stars towards your Battle Pass progress. If you follow where the knife points on the Fortnite Treasure Map loading screen, you'll see it's sticking in along the east coast amongst some trees. The point is just north of the looping race track in the desert biome, so head to that location. In grid J6, between the race track and the ruined mansion near Lonely Lodge, there are a group of four tree clumped closely together. Just to the north of them on a grassy bank you'll spot a bare patch of earth, and as you approach it the hidden Battle Stars will pop up for collection. Be warned that this area will be super busy when the challenge first launches, so be ready to fight or flee!